Students are shown a display of picture books (see More digital resources for examples) written by and about Aboriginal and Torres Strait Islander peoples. Students share any previous knowledge about their own readings of these texts and Australia’s first people. Discuss the importance of the story explored and the fact that Aboriginal and Torres Strait Islander cultures have an oral tradition of storytelling. Acknowledge that while the oral tradition of storytelling is still very important, Aboriginal and Torres Strait Islander people also use a range of different storytelling media including dance, audio, visual and the written form to share stories and pass on knowledge. Many students will be familiar with Dreamtime stories (see the Rainbow Serpent in this collection). Explain that Do Not Go Around the Edges is a different type of text. Show the pages and ask students to comment on the layout. Explain the text is illustrated with traditional Aboriginal dot form and contemporary images by Pat Torres. The students may have noticed that this is a poetry collection from the cover. Show how the poems and artwork sit alongside the story of the author’s life. Refer to the map on the inside cover to locate the area where the author grew up. The author, Daisy Utemorrah, is an elder of the Wunambal people. Students work in small groups to create a mind map. The importance of stories for all cultures is explored. The sharing of the past. Leaving stories for the future. Passing on of traditions, values and practices. What stories do your family tell and repeat? Are they written or oral? Read the text (just the story of Daisy’s life this time) and ask students to jot down any unfamiliar vocabulary they hear or any questions or ‘wonderings’ about the story. Create a vocabulary wall, where students’ words and ‘wonderings’ about the story are recorded. For example, I wonder what a humpy is? I wonder why she had to carry a bucket to the river for water? What is a walkabout? As the unit progresses add ‘answers’ and explanations of the words. Have the students choose a word, question or ‘wondering’ from the vocabulary wall. Using the text and other simple research, ask each student to explain the term, question or ‘wondering’ clearly. Read Do Not Go Around the Edges by Daisy Utemorrah to the class, this time including the poetry (this may be done over two sessions if necessary). Students share their initial understandings of the connections between the poetry, story and illustrations. What does the title mean? Read the related poem on the first page. Daisy begins the book with this poem. What is the significance of that choice? How might it relate to the beginning of her life? Encourage students to make connections to past knowledge of Aboriginal culture and story, as discussed in previous sessions. Explore the complexity of the text. The combination of personal story (biography) and poetry and art. How do these three forms of communication work together? Students read the poetry in groups, each group being assigned one to two different poems. What story do the poems tell? On each page explore the relationship between the text and the poem? Are they linked? If so how? If not, why has the author used this format. What does the poem Do Not Go Around the Edges tell us about Daisy’s life? Ask students to think about the poems and the recount. We know the character is the writer herself. Locate Kunmunya Mission on the map in the text. Post the questions below on the whiteboard. Re-read the text and stop every 3-4 pages to allow students to do a quick think-pair-share related to the theme of this text. To tell the story of her life? To write poetry to entertain? To give the reader an insight into Aboriginal culture? To make us think about growing up ‘in those days’? Students make notes each time the reading stops. Once the text has been read to the end allow time for the small groups to rethink their responses before coming together as a large group. Finish by asking if any students can see any similarities or differences with their lives using the table. A cinquain poem has five lines. 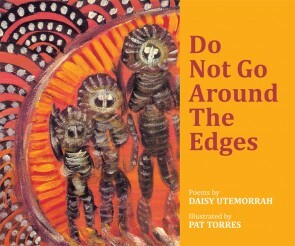 The poems in Don’t Go Around the Edges are about the life story of Daisy Utemorrah at Kunmunya Mission and her later work as a kindergarten teacher, writer and linguist. Have students write a cinquain poem using the scaffold above. This poem is to reflect a person, animal or object that is important in their lives. Students share their Cinquain poems about an important person, place or object in their lives. Revisit the poems from Do Not Go Around the Edges. In groups students read a designated poem from the text. Each group prepares a critique of the poem using the scaffold (PDF, 92KB). Groups share. In pairs or independently, have students choose a poem and re-read. Have them identify descriptive language from the chosen poem. Why did Daisy choose those particular words? How do they tell her story? Discuss the punctuation and layout of the poems. How does this help to convey the intended meaning? Students revisit their Cinquain poem and illustrate their poem in their chosen medium. Using the text as a stimulus and model, students write their own poem about a native Australian animal, bird, reptile or insect they have seen. Students revisit Do Not go Around the Edges by Daisy Utemorrah. Students write a poem about where they live incorporating descriptive language and experimenting with punctuation and layout. Use Do Not Go Around the Edges as inspiration. Students read/watch other books written by Daisy Utemorrah: Dunbi the Owl and Moonglue. Students share and compare the structure and story of these texts on the scaffold (PDF, 92KB) supplied. Explore the Eight Ways of Learning in a class discussion. See “More digital resources” at the bottom of this page. How are Daisy’s books related to this way of learning? Modelled on the layout of the book, students create their own book on paper or try using the Creative Book Builder app for publication. Students will reference their story about their life written previously and include their poetry. Students illustrate their book. Information developed by the Regional Aboriginal Education team and Early Childhood Team Western NSW, NSW Department of Education and Training. CARMEL TURNER has spent over thirty years in primary schools with her last position being principal. During that time Carmel worked with various literacy programs within her diocese and held the role of Literacy Facilitator. Five years ago Carmel joined the Australian Catholic University and lectures in many education subjects including Children’s Literature for Literacy. Carmel’s area of research is the use of postmodern picture books in the development of critical literacy.